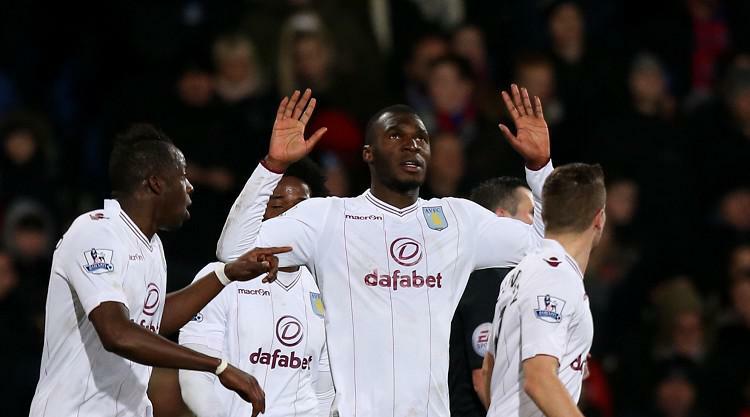 Christian Benteke single-handedly dragged Aston Villa out of their nine-game winless streak with his first goal in nine months securing a 1-0 victory at Crystal Palace. Benteke side-footed the winner in a low-quality Premier League encounter at Selhurst Park to toast his return from a three-match ban for his red card against Tottenham. The Belgian hitman was dubbed "one of the best strikers in Europe" by Villa boss Paul Lambert in midweek: the 23-year-old never had to reach that billing to decide this tie. Palace slipped to their fifth defeat in eight games, and had only themselves to blame, wasting countless half-chances in a fruitless search for a quality final ball. Villa moved three points ahead of Palace in the table, sucking Neil Warnock's side further into what could yet become one of the most widely-fought Premier League relegation scraps in years. Benteke handed Villa their first win since a 1-0 victory at Liverpool on September 13, atoning in part for his reckless dismissal against Spurs. So his match-winning strike in south London will have gone some way to repaying both manager and team-mates for that ill-judged clash at Villa Park. Benteke's calm finish punctuated the otherwise staccato arrangement of Palace's disjointed first-half attacks. Time and again Zaha broke into the final third, only to slug a sledge-hammer boot through the ball when any deftness of touch would have unlocked Villa's shaky defence. Palace backed up their 3-1 victory over Liverpool with a reasonable 1-1 draw at Swansea at the weekend, but could not find any spark whatsoever on a chilly night. However against the run of play, Palace could, and should, have stopped Benteke ever laying sight on goal for his winner. Scott Dann needlessly chased a lumped ball out to the wing, deserting his central post - and Benteke picked his pocket. Villa's only credible threat sauntered infield as far as the edge of Palace's area without bringing a challenge, because Brede Hangeland inexplicably backed off. The former Norway skipper's backtracking gifted Benteke time and space to pick his spot, and the Villa forward duly delivered. Palace boss Warnock has picked up the slack admirably since Tony Pulis walked out on the eve of the season: but here was a goal that would never have materialised in the ex-Stoke manager's tenure. Palace's profligacy was all that kept the hosts scoreless at the break, Villa relieved Warnock's men seemed to have no final ball up their sleeves. A trademark half-time rollicking from Warnock shocked Palace into renewed vigour after the break, but even cranking through the gears could not generate a clear-cut chance. The hosts wasted eight gilt-edged attacking platforms between the restart and the hour-mark, underlining both Villa's fragility and their own offensive shortcomings. Amid the one-way traffic Villa forced a break that ended when Andreas Weimann blasted straight at Speroni. The Palace keeper blocked comfortably with his legs in relief, because had the Villa midfielder would have doubled the lead had he aimed anywhere else on goal. Palace's all-out assaults grew ever more desperate as time ticked down, the final whistle bringing resounding boos from a home crowd as dissatisfied as boss Warnock.